Americans victimized by defective Takata airbags need justice. Our law firm stands ready to help, with an airbag injury lawsuit in the midst of massive Takata airbag recalls. Airbag explosions have caused at least 10 deaths on America’s roads when vehicles involved in a collision had their airbags deploy with overly excessive force. 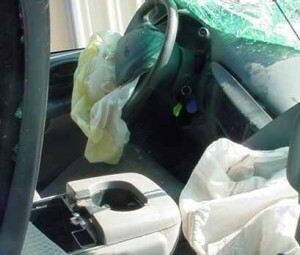 This airbag defect can send sharp shards of metal or plastic flying through the vehicle to strike occupants. Though airbags are designed to protect passengers by inflating instantly in a crash, the explosive deployment of defective Takata airbags can violently injure or even kill passengers or drivers. The defect involves a faulty inflator and propellant device which must be replaced. Or the entire airbag may be replaced, depending on the manufacturer making the airbag recall. Consumers are not obligated to pay the cost of their vehicle’s repairs after an auto recall. But the greatest price may be paid by those who unwittingly drive such vehicles and then are severely injured or killed with faulty airbags deploy explosively. It’s believed that poor manufacturing practices and poor quality control at Takata, along with years of exposure of the airbag in regions with high heat and humidity, can contribute to Takata airbags failing and exploding. When airbag propellant wafers break down because of high humidity, airbag propellant can burn too rapidly, creating excessive pressure in the inflator body and leading to a deadly airbag explosion. In fact, the Takata airbag defects recall is one of the biggest auto recalls in history. So far, as of early 2016, the defective airbag recall involves over 30 million vehicles in the United States, which were made by at least 10 different automakers. Is your vehicle among those being recalled for repair or replacement of a defective Takata airbag? We have answers for you below, or you can check your own vehicle’s status in terms of recalls for bad airbags or any other defects. To do so, submit your vehicle identification number (VIN) at https://vinrcl.safercar.gov/vin/. To be sure, automakers are required by federal law to notify owners if their vehicle has been recalled, and to make the needed repairs free of charge. However, checking for yourself to see if your vehicle has been recalled is important, because some automakers won’t notify vehicle owners of a recall unless they’ve acquired the parts needed to make repairs. That means you may be driving months longer with a deadly airbag without receiving a recall notice. Also, if you bought a used vehicle, the automaker won’t have your name and contact information on file, but rather only that of the original owner. Victims of such defective Takata airbags may be legally entitled to payments for their losses by means of an airbag defects lawsuit. The Willis Law Firm has decades of experience providing legal protection for injured Americans. Please notify us if your family has suffered a defective Takata airbag injury. We will quickly offer you a free case review, after which you can elect where or not you want to proceed with a defective airbag lawsuit. Contact us today for your free legal advice regarding your case and your potential airbag lawsuit. Your family may be legally entitled to significant economic recovery, including payments for your medical and healthcare costs; your missing present to future wages; and your pain and suffering. Again: You may be due substantial payments for your injury losses due to a defective airbag. Our law firm has experienced, knowledgeable and skilled defective airbag lawyers to fight for the rights of innocent Americans who were harmed by a negligent manufacture.